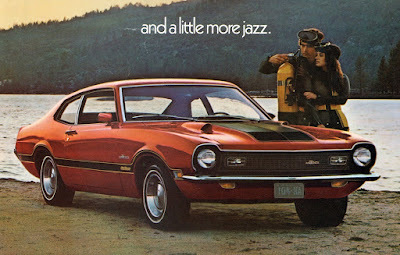 The 1970 Ford Maverick was the Blue Oval's second attempt to garner the compact market. Ford unveiled the Maverick to Canadian dealers and auto journalists at a gala. This vehicle was long overdue. Falcon’s sales tanked when the Mustang arrived in 1964. 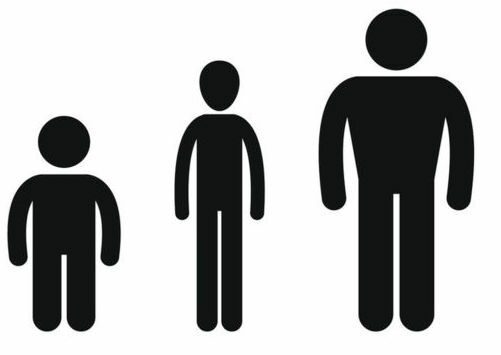 Oddly, the compact Falcon grew larger and more formal. 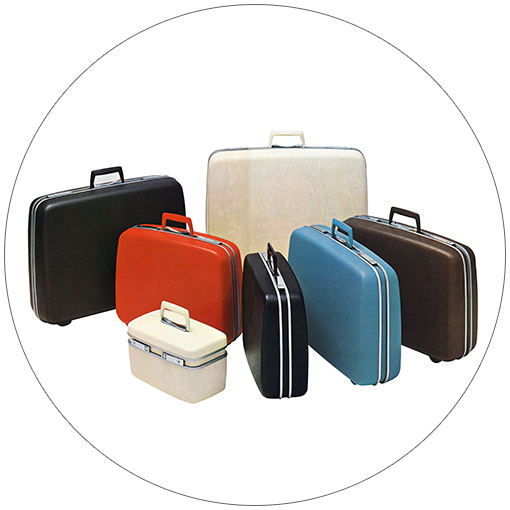 Consumers shunned it and turned once again to small imports to meet their needs. Volkswagen, Toyota, Datsun loomed as serious threats. The Isuzu Bellet was assembled in Nova Scotia, alongside the Toyota Canadian. In addition, there were domestic makes that fell into a grey area. 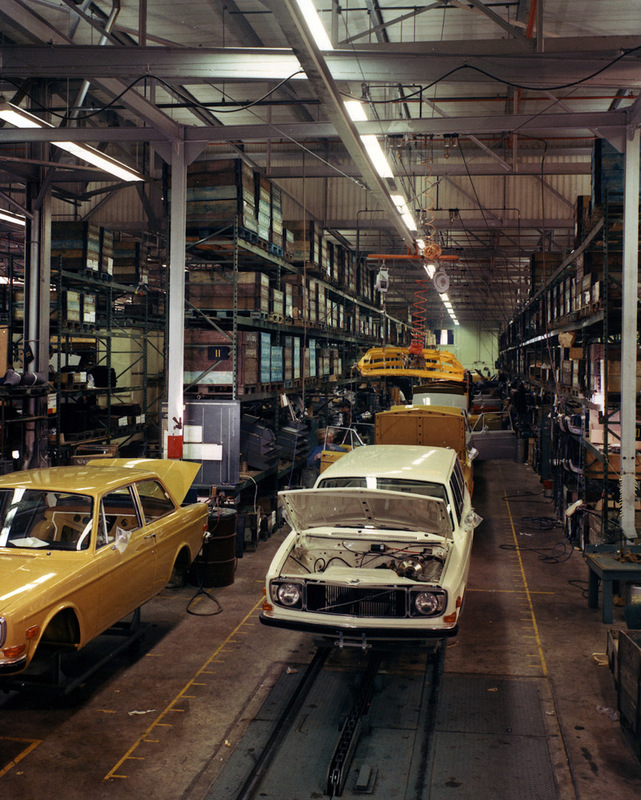 Volvo workers assembled vehicles in Dartmouth, Nova Scotia. 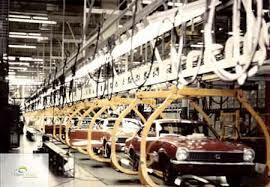 Isuzu and Toyota built cars on Cape Breton Island while Renault and Peugeot shared a plant in St. Bruno, Québec. 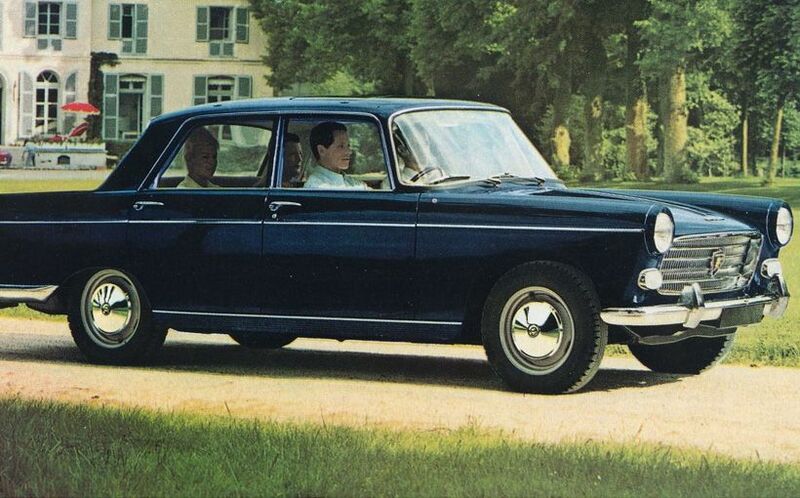 1970 Peugeot 404 was domestically sourced from Québec. At the Maverick unveiling, a detailed explanation was offered for the reasons that led to developing this compact. Research revealed there were two types of buyers for small, imported cars. Base price of Ford's Maverick was $2,375, f.o.b. Oakville. The first group pinched the beavers off every nickel they got their mitts on. Appearance, comfort and performance were noted, but it was paramount that the vehicle be of durable construction, features that were economy-driven. In short, this was the thrifty crowd. This publicity shot shows Maverick with scuba divers. The second group bought cars that complimented their active personalities. Their vehicles represented an extension of their lifestyles; they hunted, fished, played hockey, skied, sailed and participated in sports car rallies. The name was chosen with great care. 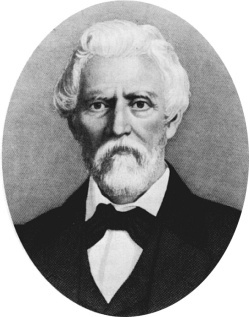 Sam Maverick was a Texas rancher and land baron during its frontier days. He refused to brand his steers, to the surprise of other ranchers. The word ‘maverick’ entered the lexicon in 1867 as meaning unbranded cattle and independent thinkers. Ford already had Mustang and Bronco in the corporate stable, Maverick bucked up the equine theme. Mavericks on the production line in St. Thomas, Ontario. Ford of Canada dropped $71 million to tool up for the new car. It was determined that the bulk of North American production would take place in St. Thomas, Ontario—and the line was upgraded to build 52 units an hour. Georgian Bay National Park is Canada's smallest, measuring less than 14 square kilometres. Maverick logo cleverly incorporated a steer's head. To develop the Maverick quickly and economically, engineers pulled components from the company’s many existing parts bins. The drivetrain was sourced from the shared Falcon/Mustang lineup, as was a suspension comprised of high-mounted coil springs in front, leaf springs and solid axle at the rear. Engines for Maverick were tried and true. 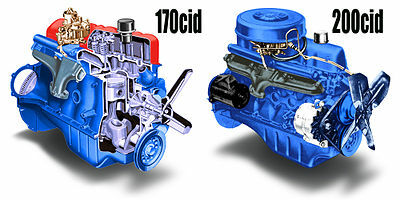 Standard power was Ford’s trusty 2.8-litre steed, 72-kiloWatt (105-horsepower), overhead-valve, inline-six, with a 3.3-litre six as an optional mill. Maverick's lines were influenced by its Mustang cousin. The Maverick's styling featured the trendy long hood, fastback roof, and a short deck popularized by Mustang. There was the merest suggestion of a spoiler at the rear. The abrupt vertical rear chop was inspired by aerodynamics; all-in-all a pert and pretty package, perched on 2 616-millimetre (103-inch) wheelbase. From behind, elongated taillights were set in a squared-off, recessed cove created by the vestigial spoiler and completed by the bumper which curved upward. The gas cap filler was placed in the centre. Maverick advertising was low-key and full of humour. The front was simplicity itself. Headlights were placed in a shallow black bezel, graced with a chromed strip that trotted gracefully across the top edge of the grille, The grille was egg crate in design, punctuated with running lights at the outer edges. 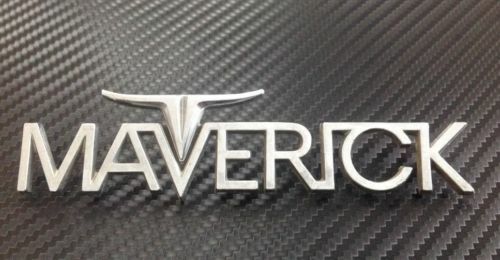 The Maverick emblem was positioned front and centre. Below the blade bumper were turn signals. 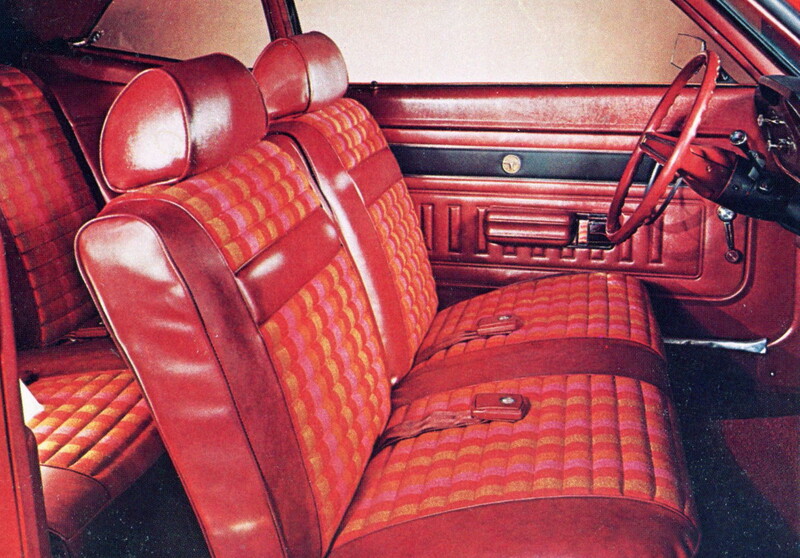 The Maverick instrument panel featured a Euro-inspired parcel shelf, rather than the traditional glove box. Initially available only as a 2-door sedan, early models had no glove box, but did feature a Euro-style full-length parcel shelf that ran below the instrument panel. 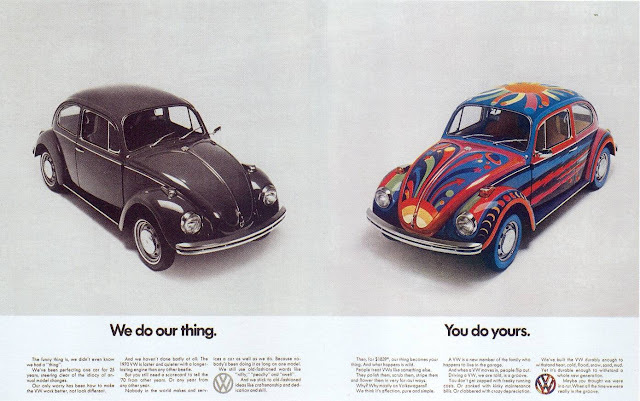 As Maverick's competition, Volkswagen advertising went wild in 1970. Maverick’s envelope stacked up nicely with targeted imports, especially the VW Beetle. The littlest Ford measured 4 557 millimetres in overall length (179.4 inches), compared with the VW’s 2 388-millimetre (94-inch) wheelbase and 4 064 millimetres (160 inches) in length. The 1 134 kilo (2,500-pound) Maverick weighed a hefty 272 kilos (600 pounds) more than than the VW. A real advantage was the Maverick’s .34 cubic metres (12.3 cubic feet) of luggage space, roughly twice the capacity of the Beetle’s. “With every generation growing taller, Canadians need more room. Maverick comes to the rescue! More leg rom, more shoulder room, more luggage room.” Passengers sank into deep, foam-padded seats. Cloth-and-vinyl upholstery—in smart tartan plaids—could be had in red, blue, nugget or white, matched to colour-keyed carpeting. The instrument panel was also colour-keyed and crowned with a thickly-padded safety ‘hood’. Easy-to-read gauges were brushed aluminum dials set in non-glare, recessed pods. Rear windows didn’t roll down, they popped opened, courtesy of a flipper. 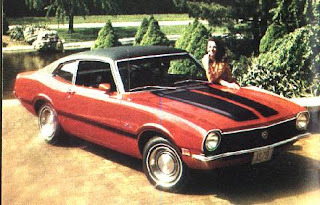 The muscle car-themed Grabber trim package was introduced in mid-1970. The bold add-ons included special graphics and trim, and a genuine spoiler. 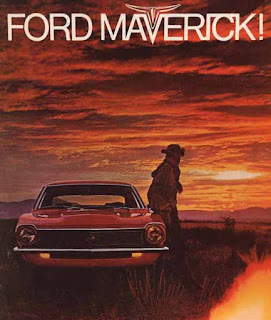 Folks scooting along the nation’s highways and byways could not miss a Maverick. Colours were outlandishly bright. 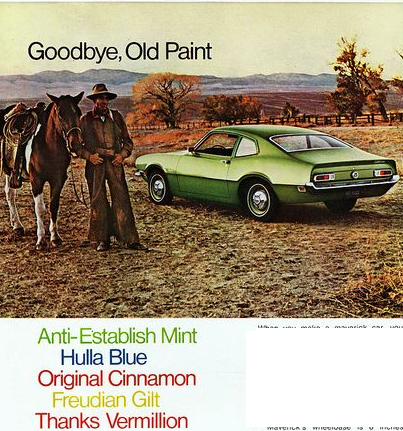 Under the headline, “Good-bye Old Paint”, exterior offerings were served up on a palette of puns: Anti-Establish Mint, Hulla Blue, Original Cinnamon (readers will have to deconstruct the syllables to get the humour), Freudian Gilt and Thanks Vermillion. 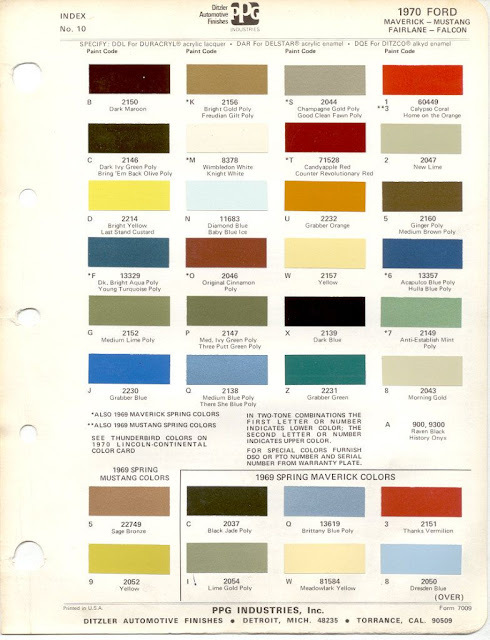 Only a wee more traditional, Mavericks could be clad in in Candyapple Red, Black Jade, Champagne Gold, Gulfstream Auqa, Meadowlark Yellow, Brittany Blue, Lime Gold, Dresden Blue, Raven Black and Wimbledon White. 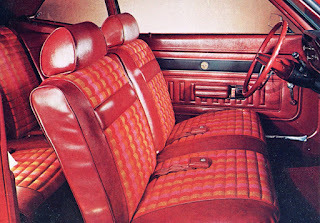 The optional Blazer strip seat trim is seen here. 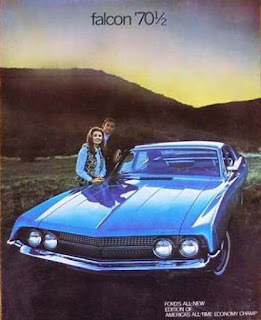 Options included the SelectShift Transmission, available only with the 3.3-litre (200-cubic inch) six. 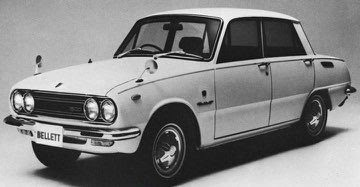 The Semi-Automatic Transmission was reserved for the 2.8-litre (170 cubic-inch) engine, SelectAire Conditional, tinted glass, day/night rearview mirror, AM radio could be ordered. The Accent Group included a bright drip rail moulding and window frames, 6.45x14 white sidewall tires, wheel covers and colour-keyed carpeting. With the Accent Group, one could order a Blazer strip seat trim. At the very end of its span, a few Fairlanes were rebadged as Falcons. Maverick did well in its maiden year, capturing a tad more than 15% of the domestic market, 10% of the American market (30% in California). 1969 domestic sales reached 23,447—with a handful of final Falcons thrown in for good measure. That was good enough to take tenth place—ahead of the Dodge Dart. It was a banner year for the domestic automobile industry. For the first time ever, more than a million vehicles rolled out factories’ doors. Maverick hit 184,447 builds, topping all makes--accounting for 17.7% of Canadian output in calendar year 1969. 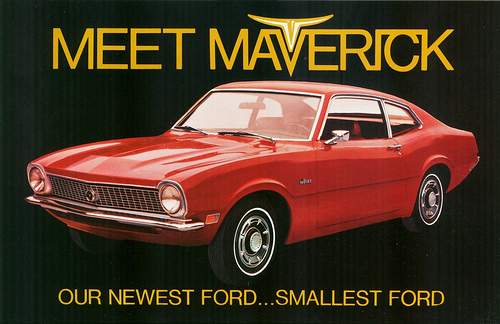 The total number of Mavericks shipped across Canada and exported to the United States during the 1970 model year tallied 159,259 units. Copyright James C. Mays 2018 All rights reserved.